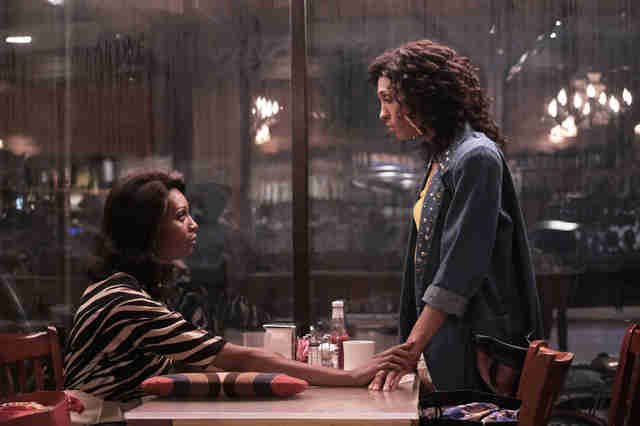 At the end of the first season finale of Pose, there is no big cliffhanger. We leave the members of the House of Evangelista on a moment of triumph. The ambitious, optimistic, good-hearted Blanca (Mj Rodriguez) has been named "mother of the year," the award that gives the episode its title, at the Princess Ball. She is lifted in the air, silks flowing around her, her children cheering. It's a fitting conclusion for what has ultimately become the most heart-warming show on television. It was hard to know how Pose was going to play out when it first premiered earlier this summer. Initially billed as a sort of Bonfire of the Vanities -- focusing on the queer ball communities as well as the upper crust businessmen of New York in the 1980s -- the project was important from the outset, featuring the largest regular cast of trans actors ever on TV. But then there was the Ryan Murphy factor to take into account. Murphy is one of our most hit-or-miss auteurs, capable of finely crafted drama (The People v. O.J. Simpson) and over-the-top cheese (many seasons of American Horror Story). But Pose ended up being something unlike anything we'd seen before from the creator and that's likely because he stepped aside and let trans talent like Janet Mock guide the narrative. The stories that have resulted are both layered and elemental, intimate and emotionally grand. The cis, white characters faded into the background. The plot became centered around Blanca and her extended universe, and was defined by its denizens' achievements rather than sorrows. The actors giving the most dynamic performances -- like Billy Porter and Indya Moore-- ended up the focus. Speaking with Screencrush, Mock said, "Everyone’s like, 'It’s such a positive show.' And it’s like, no, it’s a resilient show because it’s about a resilient community that has been here for decades, right? We’ve always been here." That resilience was on full display in Sunday's episode. It opens with the once high-and-mighty Elektra -- the domineering head of the House of Abundance who treats her children like they're all Cinderella and she's their wicked stepmother -- in a near dire situation. She used all her money -- including funds her children pilfered from a Salvation Army bucket -- for gender reassignment surgery. The procedure should have been a purely affirming moment. Instead faced an entirely new prejudice on the other side of it: She saw her worth devalued by men like her lover (Christopher Meloni), who cuts her off. They are only interested in her for her anatomy, when that is gone she is nothing to them. As the finale begins she's working in a peep show and homeless. The opening montage is devastating as she performs for a series of leering men, until Blanca appears and offers up a bed. Another series might find Elektra's situation as a comeuppance for her cruelty, but Pose rejects those binaries. Elektra's self-preservation is hard-earned, and her bitchiness is a result of it. To the writers -- and Blanca -- that doesn't mean she should be denied of basic human decency. It feels so rare to see TV where things work out for its characters. Elektra eventually gets a job as a hostess at the trendy restaurant Indochine, where she's allowed to be as fabulous and cutting as she desires. Porter's Pray Tell -- the gregarious ball announcer who loses his lover to AIDS earlier in the season -- goes on a date with a smitten admirer. He nervously comes out as HIV-positive and is met with affection, not rejection. Damon (Ryan Jamaal Swan) and his boyfriend Ricky (Dyllon Burnside) both get jobs on an Al B. Sure! music video -- but Damon decides he'll forgo the tour to complete his dance education. Blanca welcomes Papi (Angel Bismark Curiel) -- who she threw out after discovering he was selling drugs -- back into Evangelista. The cynic's take would be that the sweetness that overflows in "Mother of the Year" belongs in a fairytale not an FX drama. But that's a too simplistic read. The ball culture is a constructed fantasy -- a community where trans and queer people of color can thrive. Blanca's wells of altruism are so deep because she believes in the potential of this world to be a haven. Pose does not ignore the outside, but it chooses not to let that perspective define it, the same way Blanca lives with the knowledge she is HIV-positive, but forges ahead to support the people around her. The happy ending allows the Pose writers freedom to continue their sensitive, wholly unapologetic storytelling. One assumes the (already announced) second season will continue to wrestle with Blanca and Pray Tell's health status and the impact that has on them. (The most moving moment of season one is when they duet on The Wiz song "Home" at a performance in an AIDS ward.) It's easy to surmise we've seen the last of Stan (Evan Peters), the Trump organization employee who romanced Moore's Angel. Their relationship was a highlight -- a delicate exploration of love and power dynamics, that deepened when Stan's wife Patty (Kate Mara) discovered his affair. But Angel ultimately rejects Stan's fearful and desperate attempt at a reconciliation -- a proposal made after kicking her out of the apartment he leased for her. Without the connection to Angel, he's wholly unnecessary. And that's fine. She chooses her family, and Pose has made it clear that we should too.